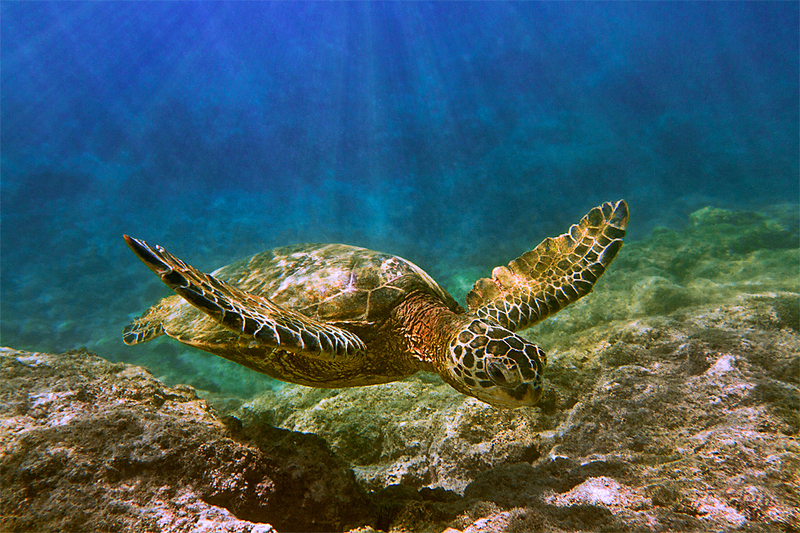 The green sea turtle, called "Honu" by the Hawaiian people, plays an important roll in the environment and culture. These turtles, which can weigh up to 400 pounds, are primarily vegetarians. They eat algae or limu (Hawaiian seaweed) that grows underwater on coral reefs and on rocks close to shore. Although sea turtles live most of their lives in the ocean, adult females must return to land in order to lay their eggs. They will migrate up to 800 miles, traveling from their feeding areas near the coast of the main islands to nesting beaches in the northwestern islands. Hundreds of years ago, millions of sea turtles swam the earth's oceans. Today, all known species of sea turtles are considered either endangered or threatened.